The 2018 Forum on China–Africa Cooperation held in Beijing this week ended with much hype as Beijing pledged $60 billion in aid and loans to African nations. But behind the fanfare are social and economic problems that African countries face as a result of Chinese investment—as in the case of Kenya, which is seeking to modernize its infrastructure even as the nation’s debt load is ballooning. With Kenya’s public debt reaching about $50.6 billion, President Uhuru Kenyatta has been criticized for irresponsibly borrowing from Beijing, according to a Sept. 5 article by Kenya’s largest independent newspaper, Daily Nation. As a way to ease some of that debt, Kenyatta, while in Beijing, asked China to split the $3.8 billion cost for building the next phase of the Standard Gauge Railway (SGR) into 50 percent loans and 50 percent grants, Daily Nation reported. If China is willing to foot half of the bill for the next phase of the Standard Gauge Railway (SGR) in the form of grants, Kenyatta said, taxpayers in his country would only need to pay for half of it, or $1.9 billion. Many Kenyans consider China the biggest threat to the country’s economic development, according to another recent article by Daily Nation, citing a survey conducted between July 25 and Aug. 2 by market researcher Ipsos Synovate. Among those polled, 26 percent see China as a threat to Kenya’s development, while 38 percent believe the relationship between Kenya and China will lead to job losses. Another 25 percent say that the Kenyan economy will be hurt by imports of cheap Chinese goods, while 8 percent believe that China’s influence will foster corruption in Kenya. Corruption is one of the concerns voiced in a report presented at a U.S. congressional subcommittee hearing on Africa and global human rights held on March 7. The report indicates that some contracts signed between China and top officials in the Kenyan government are shady, greased with bribes and other antecedents, such as all-expenses-paid shopping trips to China and scholarships given to Kenyan elite. “China plays a big part in corrupting leaders to gain business advantages through corruption within Africa, especially in Kenya,” the paper stated. Kenya’s debt to China has ballooned in recent years, according to Kenyan media. Debt owed to China stood at $4.75 billion in 2017, an increase of 52.8 percent from the previous year, and a seven-fold increase from 2013, according to an Aug. 21 article by Kenyan news site Kenyans.co.ke, citing data from the Kenya National Bureau of Statistics. That amount figures to grow as Kenya moves to the second part of phase two of the SGR. The mounting debt has some Kenyan experts worried. Jaindi Kisero, a former managing editor with Nation Media Group, the largest independent media house in East and Central Africa, warned that the country could fall into a debt trap, much like what has already happened to Sri Lanka, in an opinion article he penned in the Daily Nation that was published in May. “The Chinese will readily offer you infrastructure loans, but you will only start feeling the pinch when the time for servicing the debt comes calling—and you realize that your economy is not raising enough dollars to repay it,” wrote Kisero. He added that Kenya must pay back about $258 million in debt to China in 2018, and about $814 million next year, citing data from Kenya’s National Treasury. Sri Lanka handed over control of its main southern port located in Hambantota in December 2017, after China financed an OBOR project there. Sri Lanka was unable to pay back the $6 billion in loans and, thus, converted the debt into equity. Eric Wamanji, a public relations and communication expert, in an opinion article published in the Daily Nation in August, warned of China’s loans, not only for Kenya, but for other developing nations as well. “China is a calculating financier. Most of its loans are collateralized against strategic assets like minerals or seaports,” Wamanji wrote. In Congo, for example, China has seized mining rights to copper and cobalt deposits—key materials for developing China’s new vehicles industry—after years of investment in the central African nation. “When states default on the loans, this affords China the liberty to seize assets, and even territory, in lieu of the repayments,” Wamanji added. The SGR is part of China’s One Belt, One Road (OBOR, also known as Belt and Road), Beijing’s massive investment initiative with countries throughout Asia, Europe, Africa, and Latin America. Kenya is considered a strategic point in the maritime trade route laid out in OBOR plans, which runs from China through Vietnam, Malaysia, Indonesia, Sri Lanka, Kenya, Greece, and finally, to Italy. To push forward its OBOR initiative, Beijing has claimed that its projects will create jobs for locals where projects are being built. Yet, the contrary is often true. In October 2014, Kenyan youth blocked a section of a highway in Voi, a town in Taita-Taveta County in southern Kenya, to protest against China Roads and Bridges Company. The Chinese firm, contracted by Beijing, had hired foreigners instead of locals to build a section of the SGR, according to Daily Nation. The same company was also the target of another protest in the same town in May 2017, with local youth protesting hiring discrimination against locals, according to Daily Nation. 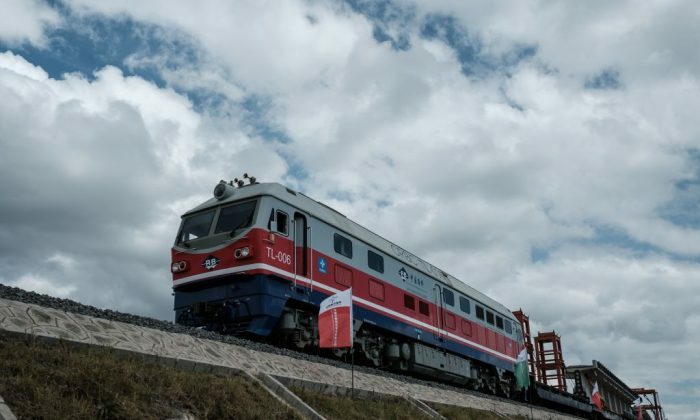 Phase one of the SGR, a roughly 300-mile-long railway connecting Kenya’s capital Nairobi and the coastal city of Mombasa, was built at a cost of $3.2 billion with Chinese financing and inaugurated in June 2017, according to Reuters. China’s state-run Export-Import Bank of China paid for 90 percent of the cost, and the Kenyan government paid the remaining 10 percent. The first part of phase two, a roughly 75-mile railway linking Nairobi to Naivasha, a town located northwest of Nairobi, is currently under construction. Mombasa eventually will serve as a trade gateway in East Africa, as the SGR will link to railways in Uganda, Rwanda, Burundi, Democratic Republic of Congo, South Sudan, and Ethiopia. The second part of phase two—at a cost of $3.8 billion—is a railway linking Naivasha and Kisumu, a port city on Lake Victoria, a body of water bordered by three nations: Uganda, Kenya, and Tanzania.